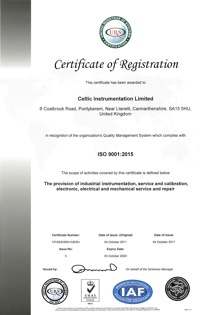 Celtic Instrumentation Ltd provides an on-site calibration and certification service for the liquid metals industry. Geographically, we cover the whole of England and Wales and routinely visit contract customers on the South Coast and as far North as the English Scottish border. We strive to group our contracts in an efficient cost-effective way as to keep our charges as low as possible to our customers. We provide on-site UKAS traceable certification on most of the temperature measuring instruments (pyrometers) and carbon equivalent analysis instrumentation found in UK foundries. We carry genuine metallurgical spare parts and compensating cables in our service vehicle to provide on-site repairs to pyrometers and associated equipment. Our workshop can also carry out refurbishment work should the need arise. As with all other sectors of work that we undertake, our foundry test instrumentation carries UKAS traceable documentation as to provide customer confidence in the work that we undertake. Certification and historical data archiving of all instrumentation that we test is carried out in accordance to our ISO 9001:2015 quality management system.